The new Baier Hidden-Hinge, fully-articulated commercial marine flush deck hatch assembly for workboats adds the convenience of a built-in recessed Stainless Steel T-handle to the flush-mounted, quick release, lift-out hatch. The design is especially useful for on aluminum boats, crew supply vessels (CSV), fishing vessels and other workboats, as well as many U.S. Navy and U.S. and Canadian Coast Guard vessels. This new hinge assembly works exceeding well when installed vertically like a door — it pivots easily and maintains alignment. 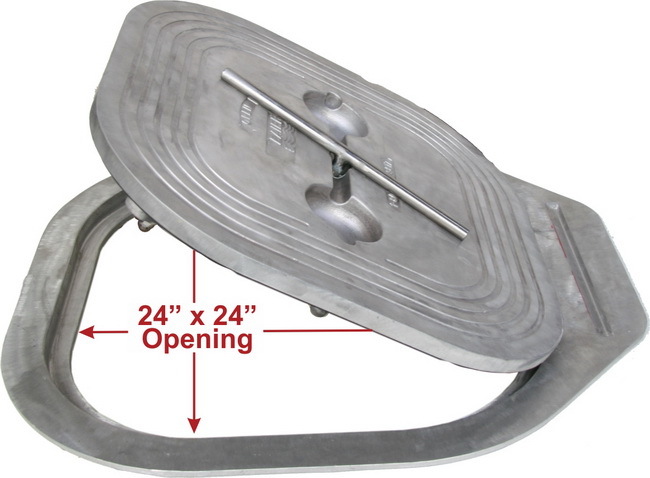 An over-center auto stop holds cover securely open at 120 degrees, and the hatch cover slides further open to over 180 degrees.